An article by Rand Fishkin made me think deeply about what I do for a living. “Content marketing” is what its called now. We used to call it blogging. If I abstract it one level, what I think we’re really talking about is writing. Nowadays we’d also include making videos and images. 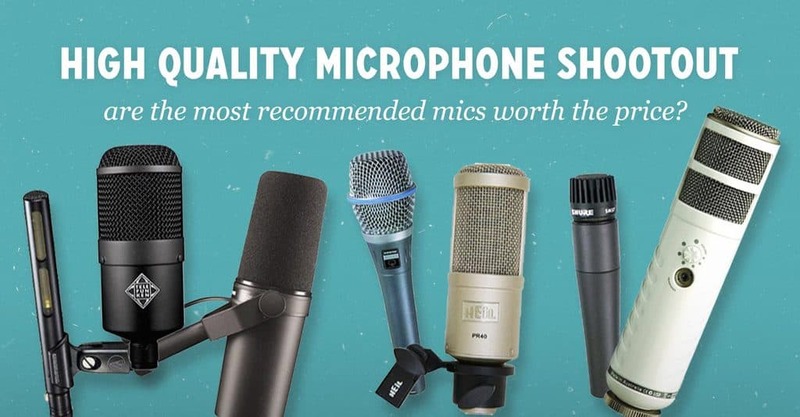 I guess podcasts should be in there too. Might as well include painting and direct mailers and lanyards with logos and giveaways at conferences as well. and it’s helpful and it’s useful. That’s how it started. And it was so helpful and so useful it became a thing with a name and there were tracks called “content marketing” at conferences and books about it and sections for it in online bookstores. Some of us have been “content marketing” for years. We know exactly what it is, what it’s like, how it feels, how it works. And this article from Rand (a response to this article) poses the question: Are we putting ourselves out of business? Are we answering questions nobody’s asking? Are there too many “content marketers” for any one of them to achieve much success anymore? Are we doing what advertisers have done to advertising? Are we making next years version of a banner ad? Here’s the brutal truth: yes. Every thing you make reduces the impact of every other thing you’ve made. We’re marketers, we ruin things. We’re ruining “content marketing” too. 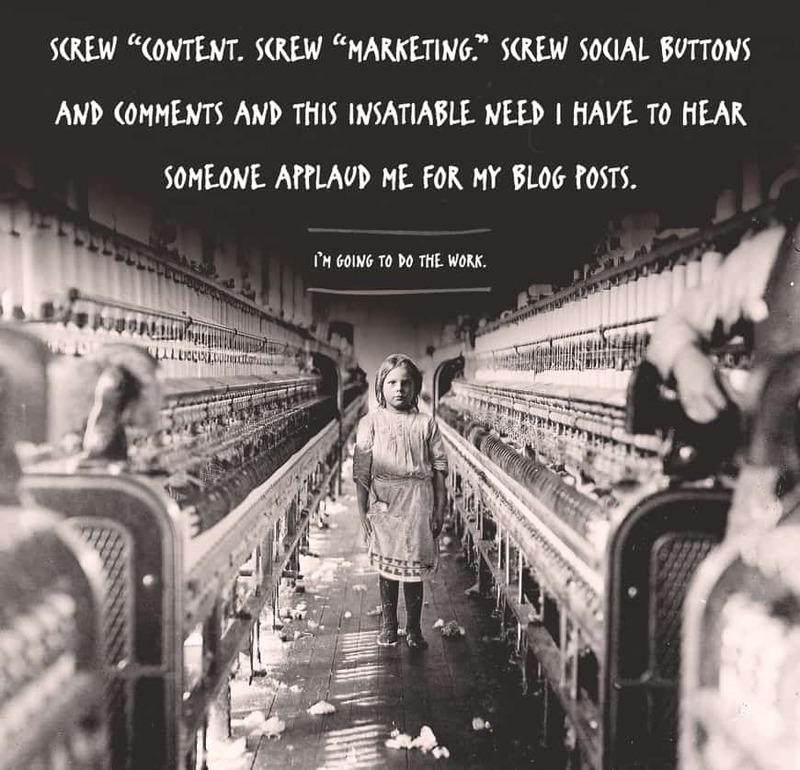 Screw this insatiable need I have to hear someone applaud me for my blog posts. Screw how I judge myself based on how much an article was shared or how much a video was liked. Screw list posts and polls. Screw everything about this industry (except anyone who’s using funny gifs… you’re cool). 1. Love this work… for the right reasons. Writing is about connecting, about sharing darkness, about shedding light, about being a corkscrew, about digging and helping people take a step and move forward and lean a smidge out of the loneliness and decay and brokenness and disconnection and into a little hope and improvement and happiness for a moment in the bore. Writing and making and filming and publishing and creating is the work… The work is it’s own reward. Love it for the right reasons. 2. Grow an audience now. It’s only getting harder. Discover who you are, decide who you’re going to serve, dig in, care, try, click publish and wish more people saw it and wonder why more people aren’t sharing it and make more stuff and click publish again and again regardless. Help and be honest and get better over time. If you’re anything like me, the only way you get to a point where you’ve discovered who you are, how to be yourself and how to be useful to a crew is by clicking “publish”… a lot. But I don’t agree with the line he draws for the rest of us. 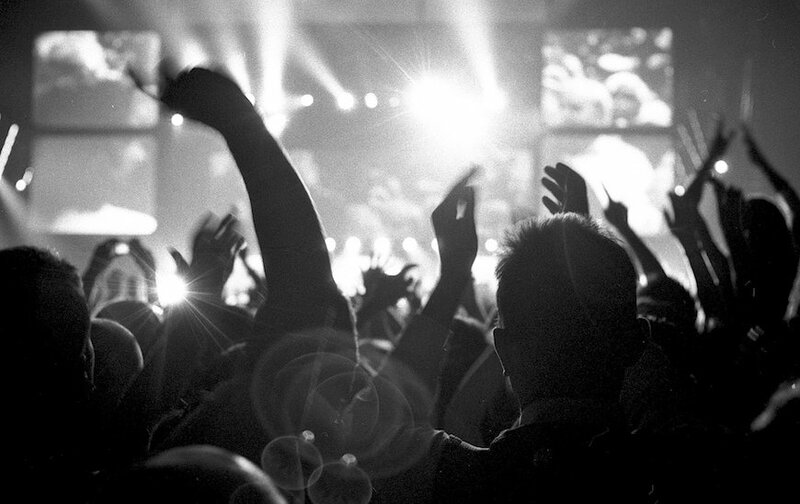 You can absolutely earn a living from a small and meaningful audience. You can absolutely build a relationship with earnest people by going to dark places and sharing what you learned. The opportunities are still there. Maybe they seem smaller than before, more niche, more specific, more intentional and focused. But that’s because the internet as we know it is only about 15 years old… it’s maturing. The opportunities are there for those who care enough to try. Maybe the opportunities seem harder. We talked about that before. I think it’s true that it’s going to get harder and harder to get a million people to your website. But it’s easier than ever to get in touch with and make meaningful things for every single unicicle riding, utilikilt wearing north Portlander. “Content marketing” may be eating it’s own tail, but the market for usefulness and improvement and education and love and help and desire and humanity grows with every baby born. So get into that market.